(Bloomberg) -- HCA Healthcare Inc. investors had their worst day since President Donald Trump’s surprise 2016 election triggered a sell-off in hospital stocks as investors feared Republicans would follow through on his campaign promise to dismantle the Affordable Care Act. The company’s shares shed $4 billion in market value on Tuesday as concerns about universal health-care coverage spread to the hospital industry. Analysts who cover HCA, the largest and most-widely owned hospital operator, have remained notably silent, sticking to their ratings and issuing no commentary on the 10 percent move. 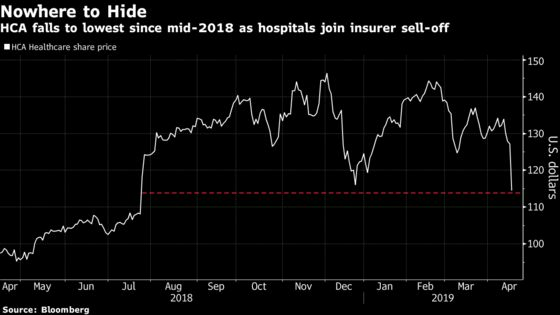 The plunge comes as health-care strategists have started to sound alarms about potential risks for hospitals, which have managed to skirt the rout that sent insurers to the lowest level in a year. The slump also spread to bonds, with the company’s senior unsecured issues due 2029 leading losses in the U.S. high-yield market, according to Trace bond trading data. The 5.875 percent notes fell 1 cent on the dollar to trade around 107.25 on Tuesday, down from around 108.25 a day earlier, Trace data show. Analysts had looked to UnitedHealth Group Inc. for some relief from the recent sell-off. But the insurance company failed to quell concerns, saying that such drastic proposals would disrupt the health-care industry and existing private, public partnerships could be a better way toward universal coverage. Reports that audiences cheered the government-run system proposal as it was being discussed by Senator Bernie Sanders of Vermont at a Fox News town hall on Monday only made things worse. “The market is ascribing an inordinately high probability that some form of Medicare-for-All proposal could become reality,” Cowen analyst Charles Rhyee wrote in a note. The problem is that even support among centrist Democrats is “noticeably absent” and the proposal would likely see strong resistance from doctors and hospitals, said Rhyee, who covers health insurers. “In our view, Medicare-for-All fails the Occam’s razor test,” Rhyee said.